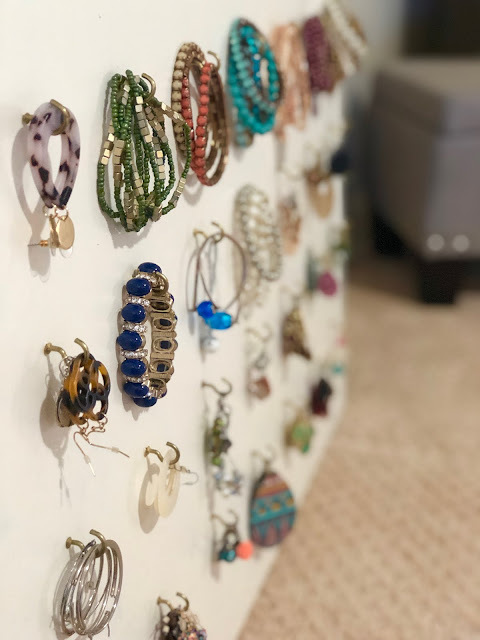 Last when when I shared about my new "blogger room" I posted this picture on Instagram and got so many questions and comments about my jewelry board that was seen in the background. 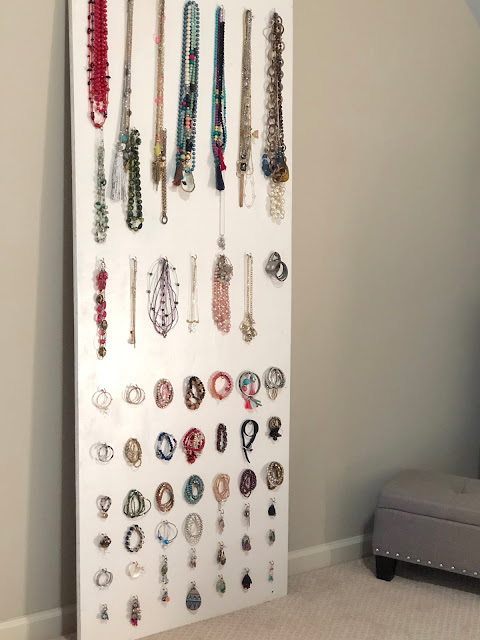 I decided to do an entire post dedicated to organizing jewelry and share how I keep mine organized. Many years ago my friend L told me about a jewelry board that her husband had built for her. 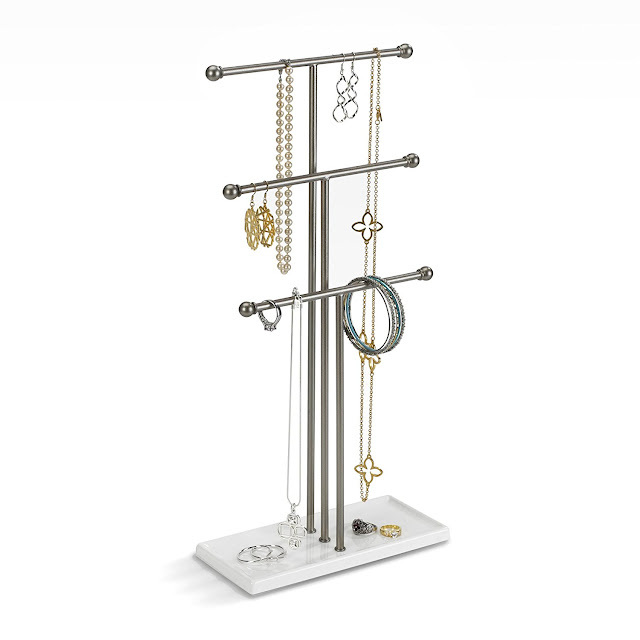 She told me how she was wearing her jewelry so much more because she could see it all and that resonated with me. 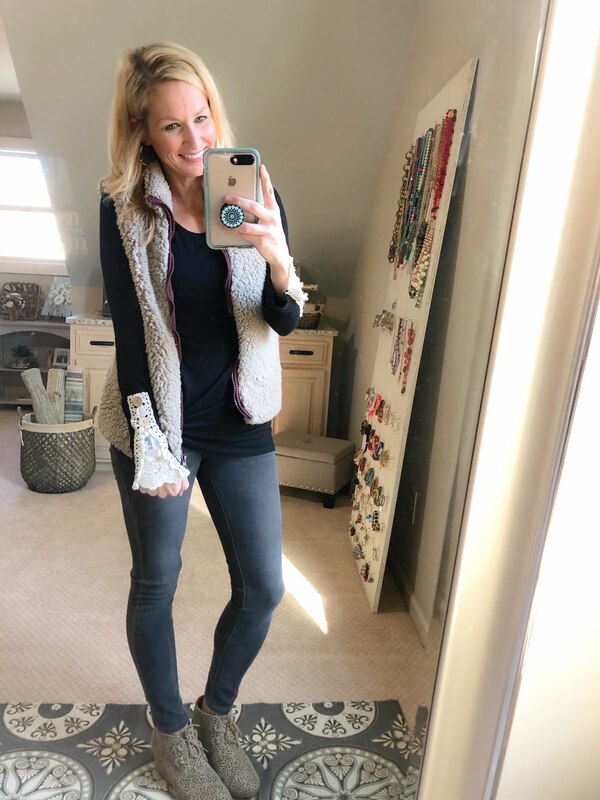 I had SO many really cute things, but always wore the same stuff over and over because everything else was either put away and like the old saying goes...out of sight, out of mind. 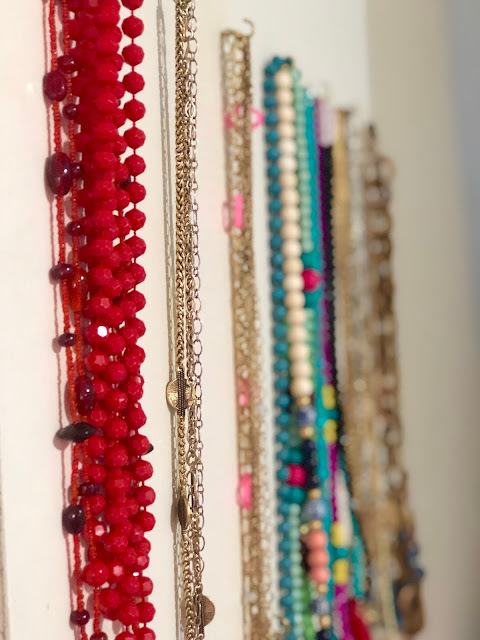 If I did go to try to find a necklace or bracelet it was most likely in a tangled mess with all of the other stuff and such a pain to have to try to deal with. I asked the Mr. if he could build me a jewelry board and he said it would be a piece of cake. I kind of took inventory of all my jewelry back in the day and decided that I wanted a few rows for long necklaces, a few for shorter necklaces, and then the rest of the hooks were spaced closer together to hold bracelets and earrings. 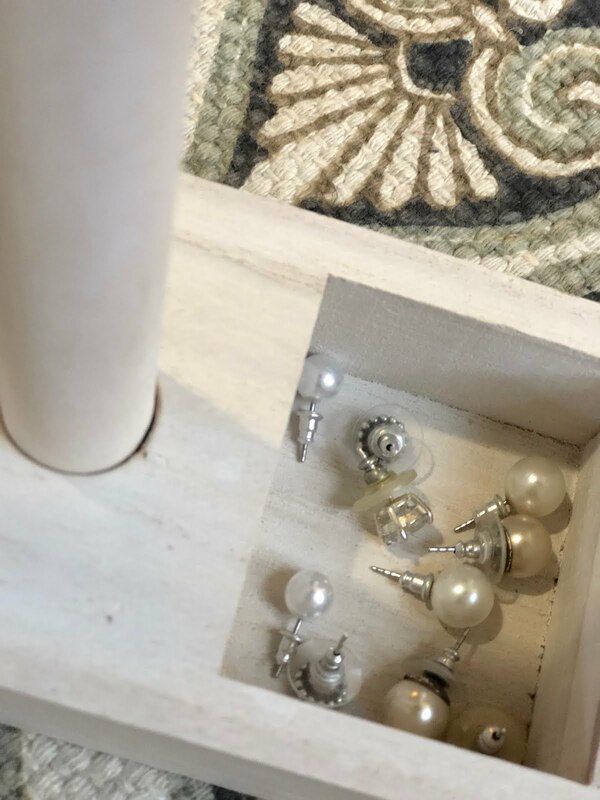 We already had a piece of plywood cut about the right size in our basement left over who knows what so he sanded and painted it and bought these little hooks. Then my dad was in town so he helped finish it up and it is has lived in my closet ever since. Mine is about 6 feet tall and 3.5 feet wide. After getting it all organized I completely agreed with my friend. I was wearing all of my jewelry SO much more because I could see it all. I think that no matter how you decide to organize your jewelry, being able to easily see it all is key! 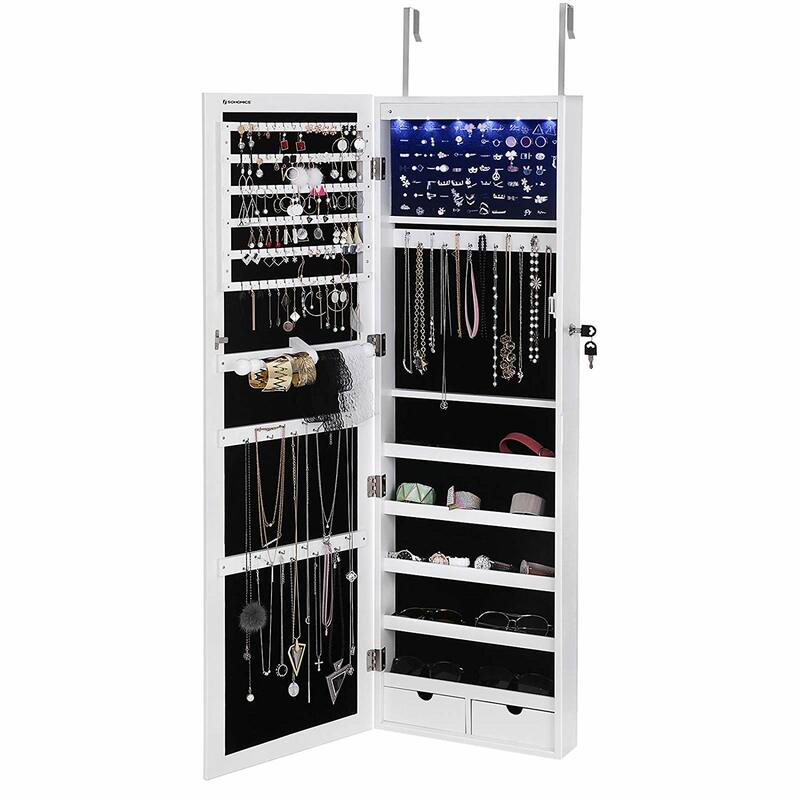 Then after you get dressed you an easily scan what you have and decide what pieces of jewelry you want to wear! I also have a jewelry box that I keep some special pieces in and things that I don't wear as often and don't want hanging on the board. I also have this jewelry stand that I bought from Michael's last year that I keep cuff bracelets on (because they don't really hang well on the jewelry board) and also my watches. 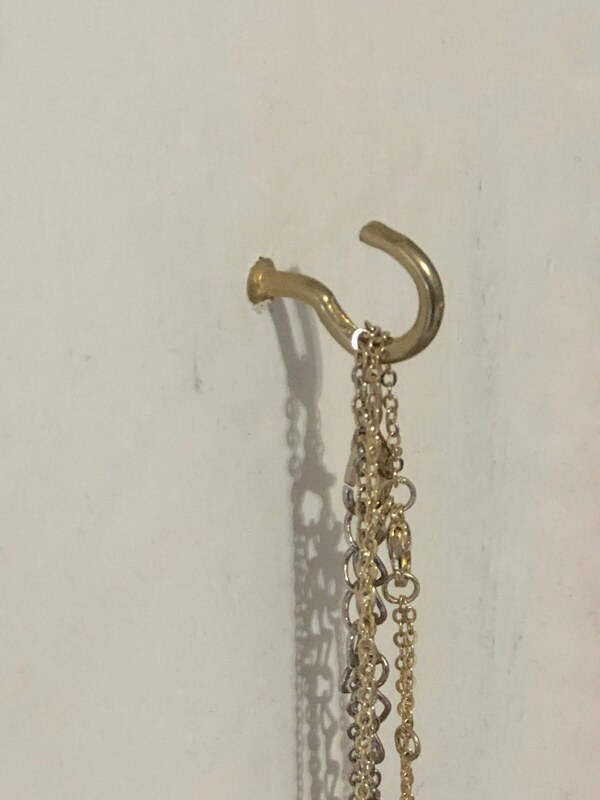 It even has little spots where I keep my small post earrings that I wear frequently. In my girls' rooms I have used small command hooks in their closets to hold and display their necklaces. It is a very cheap way to be able to see it all, but I feel like I'm about on the verge of needing to get them something else. 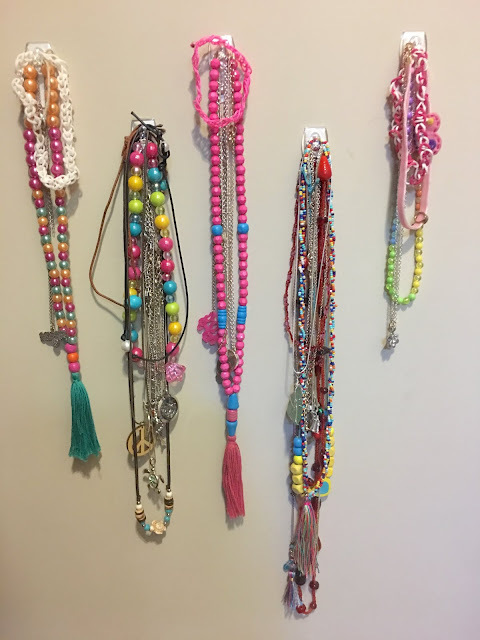 They have a lot of necklaces and they often get tangled because they have so many hanging on each hook. I checked Amazon to see if there was something that might work for them and actually found several great options! 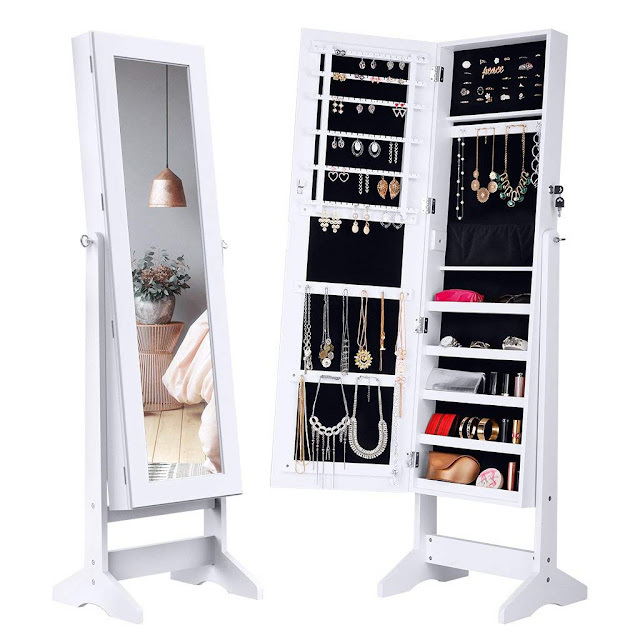 This Jewelry Armoire with mirror is nice because it is multi-purpose. I love that it serves as a full length mirror, but open up to all of this jewelry storage. 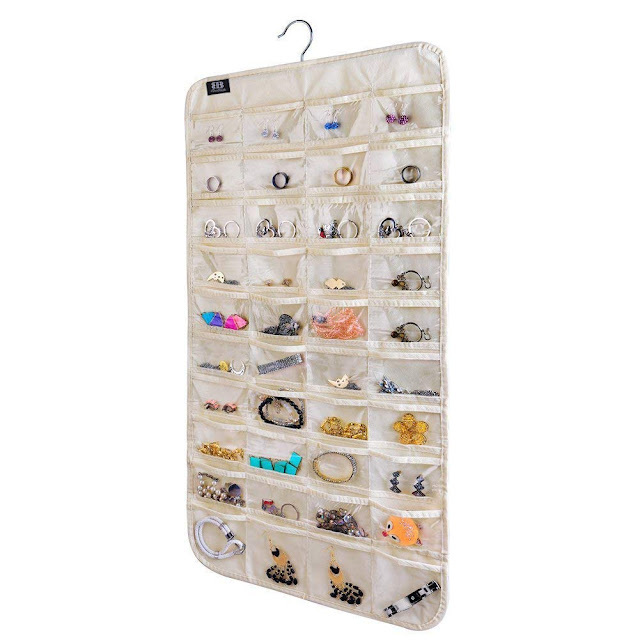 This is a similar option that is an Over The Door Jewelry Organizer . You could hang it on the back of a closet door to save space, but still have lots of organizational options. 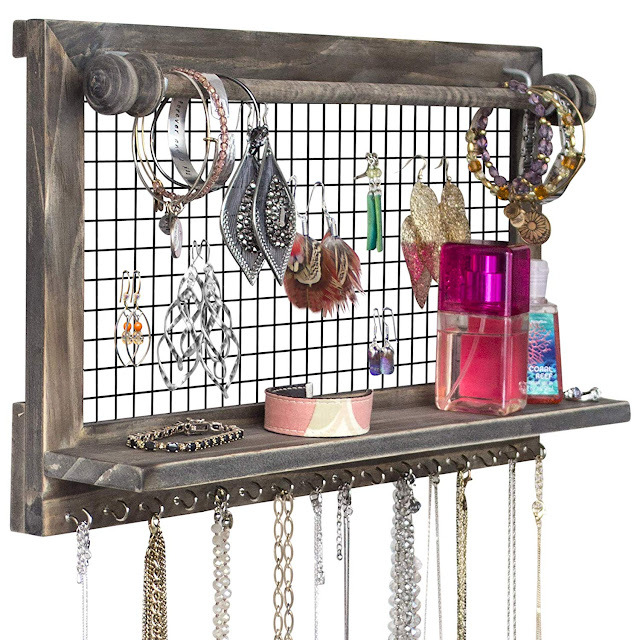 This Rustic Jewelry Organizer is a good option if you don't have a ton of pieces that you want to display/organize. Plus, it takes up a lot less space. I've seen these Pocket Organizers for Jewelry before and feel like they are great because you can hang it over a door or in your closet and then when you travel it is easy to wrap and take with you! 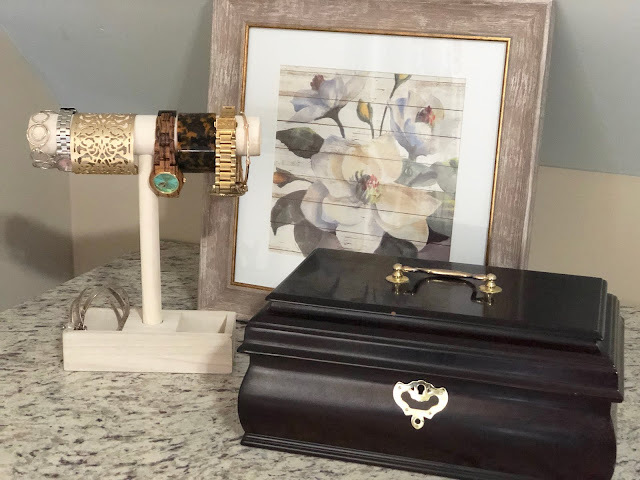 Lastly, this Table Top Jewelry Holder would be nice to set on your bathroom counter or on a dresser to hold pieces that you wear more frequently. 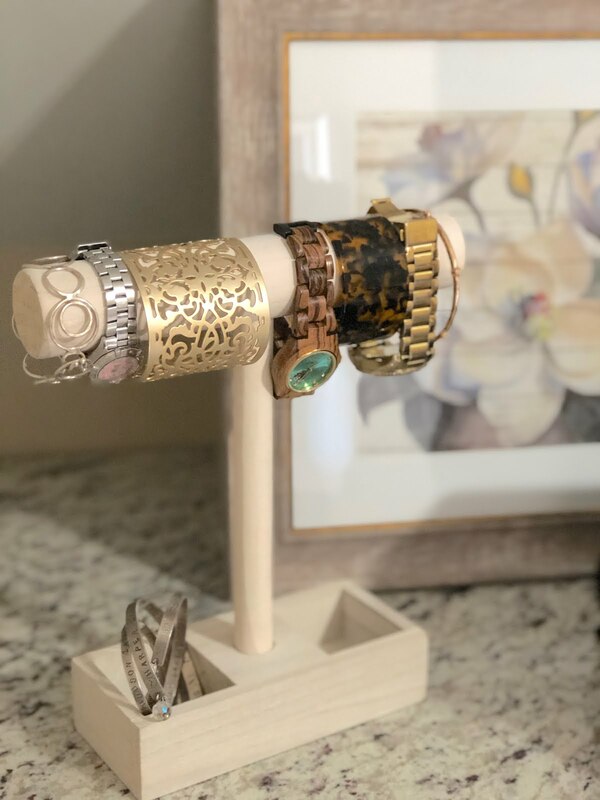 I pinned a bunch of other DIY ideas and organizational tips for jewelry on Pinterest, so you can check that out here! No matter how you decide to organize your jewelry, make sure you can easily see and access it all so that you can completely transform your outfits by wearing the amazing jewelry you probably already own!